Peanut allergy affects up to 1 in 50 school age children in the UK and its occurrence has more than doubled in the last 10 years in the UK and North America. The Learning Early About Peanut Allergy (LEAP) study was a randomised open-label controlled trial, which enrolled 640 children aged 4-11 months from the Evelina London Children’s Hospital who were considered at high risk of developing peanut allergy due to pre-existing severe eczema and/or egg allergy. Results from the study, |published in the New England Journal of Medicine in February 2015, showed that a greater than 80% reduction in the prevalence of peanut allergy at aged 5 demonstrating that consumption is an effective strategy to prevent food allergy. This contradicts previous guidelines – deliberate avoidance of peanut in the first year of life is consequently brought into question as a strategy to prevent allergy. This is an important clinical development and suggests that new guidelines may be needed to reduce the rate of peanut allergy in children. Last year, researchers concluded a 12-month extension of the LEAP study, LEAP-On, which investigated whether participants who had consumed peanut in the primary trial would remain protected against peanut allergy after cessation of peanut consumption for 12 months. The “EBSTEM” clinical trial on recessive dystrophic epidermolysis bullosa (RDEB) has led to a change of clinical practice for children. Potential clinical benefits of intravenous bone marrow mesenchymal stem cells (BM-MSCs) were identified as a disease modifying intervention for children with RDEB. Considering that there are currently no treatments available for RDEB, this trial identifies potential clinical benefits of intravenous MSCs as a disease modifying intervention for children, leading into change of NHS practice. The NHS is currently funding the intravenous BM-MSCs which constitute a novel therapy in NHS practice. The economic benefits of this novel therapy are in cost savings for dressings and carer time, which are expected to be cut by half. The children in the trial have now started to receive MSCs as part of their NHS care and the NHS has committed to funding 2 rounds of cell therapy. Further studies are planned to address optimal cell dosage and frequency of re-treatment (McGrath). The recent results of the EBSTEM trial are a step forward in the development of a new treatment for people living with RDEB. The results of the trial have now led to changes in NHS practice. Notably, the NHS is currently funding further intravenous BM-MSCs in the trial subjects to determine how best to implement this novel cell therapy in NHS practice. The Antibody Discovery Programme’s team led by Dr Sophia Karagiannis have a world leadership position in the development of Immunoglobulin E (IgE) antibody therapeutics for cancer. The team has led the discovery of the concept of IgE antibody class for cancer therapy and are the first internationally to translate an IgE class mAb therapeutic to Phase I (first-in-class, first-in-man) clinical trial for patients with solid tumours. The group engineered and studied the first-in-class IgE therapeutic agent (MOv18), developed all pre-clinical model studies, toxicological evaluations and designed the clinical trial and assays. Strong pre-clinical data in three disease-relevant models and numerous functional assays indicated capacity of the agent to direct immune responses against target-expressing ovarian tumour cells. The team’s first-in-class IgE-based agent is now expected to enter the clinic in partnership with CRUK for clinical application in a number of indications including ovarian carcinoma and mesothelioma. This unique study will be accompanied with a package of tailored clinical assays with which the team are expecting to evaluate safety, pharmacokinetic and pharmacodynamic properties, to dissect patient immune responses and mechanisms of action of this agent in the clinical setting. Targeted IgE-based therapeutics for cancer provides a platform technology with many new Intellectual Property and pipeline development opportunities. Preparations for a first-in-man clinical trial are now underway. Novel antibodies targeting colorectal, breast and liver cancer antigens are being generated, with encouraging efficacy and mechanism-of-action readouts, providing confidence in the concept of this platform technology. A ground-breaking technique of utilising scans of the heart and 3D printing to generate physical replicas of patient’s organs has been developed with the BRC. The replicas allow surgeons to see, measure and “hold” the patients hearts and to tailor their surgery before they commence operations. This technique was utilised at the Evelina Children’s Hospital on a 2-year old patient who had a large hole between two chambers in her heart. The creation of the plastic replica of her heart allowed surgeons to determine the exact size and position of the hole allowing the optimal design of a patch to repair the defect successfully. Rheumatoid Arthritis (RA) affects more than 500,000 people in the UK and around 20,000 new cases are diagnosed each year. Treating patients with RA costs the NHS around £560million a year – there is no cure and drugs can only slow the progression of the disease or reduce the pain it causes. A drug currently used to treat patients with RA, Abatacept, is the subject of a new study into the prevention of RA under the NIHR TRP in Inflammatory Joint Disease. The drug is already used to treat patients with RA at a cost to the NHS of about £10,000 a year per patient. Abatacept is manufactured and supplied in this study by British Myers Squibb along with a grant of £3million, and is being trialled in 31 hospitals in this study designed to prevent RA rather than treating the condition once it has been established. The study, led by our BRC, will involve more than 200 people who are at high risk of developing the disease. A blood test can identify patients at high risk of developing RA and participants in the study are selected due to existing joint pain but no swelling. This large-scale trial is an important first step in towards preventing this chronic disabling disease which is vital to for patients’ quality of life and could widen patient choice if other conventional treatments have previously failed. Cardiac arrhythmias are common, affecting 3-5 % of people over 40 years old, which is expected to increase due to a growing and ageing population. Cardiac arrhythmias cause considerable morbidity and significant mortality as well as anxiety in patients and their relatives. Early and accurate diagnosis is essential for the selection of the appropriate treatment. Over the last decades the application of ablation therapy has shown as a successful alternative over drug treatment. For this, the arrhythmogenic substrate is elucidated by measuring the electrophysiological (EP) signal inside the heart. It is often possible to completely cure the condition by either burning the endocardial surface where the abnormal electrical activity is originating or to block the propagation of the abnormal electrical activity. Research within the BRC has developed a robotic image-guidance system of EP-procedures in collaboration with Phillips and Imricor Medical Systems. This system consists of a novel MR-compatible catheter device for flexible 3 degrees of steering without twisting the shaft. This approach allows flexible steering inside a heart chamber and can provide good mechanical contact in all directions. All components have been made MR-compatible allowing its use under MR-guidance. In particular, MR-tracking coil technology has been integrated allowing fast localization of the device with MRI. We have recently acquired an inflatable MRI scanner to help children overcome anxiety and to practice lying still before they enter a real MRI scanner. The custom-made inflatable scanner is designed to be identical to the 3T Philips scanner being used by the Perinatal Imaging team. Kings Health Partner’s (KHP) Centre for Global Health played a vital role in the Ebola outbreak in Sierra Leone, establishing a command centre at Freetown’s hospital where Ebola-infected patients are treated. As the pathogenic mechanisms of Ebola are poorly understood a major new initiative is being established, supported by the BRC, which aims to undertake collaborative basic, translational, epidemiological and public/global public health research. Unique patient samples from Ebola-infected patients as well as convalescing patients are used to better understand mechanisms of the disease and potential future treatments. Renal Transplantation is the largest of the solid organ transplant programmes with around 3,000 performed annually in the United Kingdom and is the optimal treatment for patients with end stage kidney disease, with survival, quality of life and health economic advantages. The limited lifespan of the transplanted kidneys means that multiple transplants are often required which places a burden on patients and restricts the availability of organs for all suitable recipients. A barrier to understanding and research is the limited availability of clinical data from large numbers of patients. The four collaborating centres perform around one third of all renal transplants in the United Kingdom. By working in collaboration, we can answer questions that would not have been possible otherwise. Analysis of the rich sources of renal transplantation data held in hospital systems will provide insights into outcomes and ultimately improve patient care. 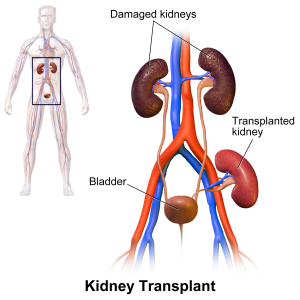 An important reason for transplanted kidney loss is recurrent disease. Our understanding of the disease remains limited. We have chosen this area to research in order to maximise potential from a collaborative approach. We will study risk factors for the development of recurrent disease in kidney transplants, including genetic differences, which could be valuable in predicting which groups of patients are at high risk of disease recurrence. If you would like further information please contact us by email at brc@gstt.nhs.uk. Find out about research resulting from this project.